Hear it from the source! has kindly written an overview of her curriculum. Do you use TruthQuest History? Add your Review! Greetings! It is lovely to meet here over the topic of history...for history is one of the prime opportunities we have to show our children the hand of God, the heart of God, the truth of God, and the presence of God in this world. We can do that only if we get history's focus off human derring-do. Think about how we were taught...as if humans were the great driving force of the universe...when actually God is, and people have the privilege of responding to Him and His truths! How humans do respond determines their government, art, science, economics, literature, architecture, and so much more. All those facets have real meaning when seen for what they are: outworkings of the deepest spiritual beliefs of individuals and nations. And these outworkings show over and over again that blessing comes only from God's truth! Your kids will see the unshakeableness of God's truths with the Egyptians, Greeks, Romans, etc., up to the modern ages, while they learn all the meat of history too. That truth has power in the past, the present, and the future! This is what I felt led to teach my own sons, and what I wanted to share with those using my living books library. From those seeds, TruthQuest History was born. It is only a servant, though, not a master. TruthQuest History (TQH) can be described more accurately, perhaps, as the current that undergirds your family as you flow through the epochs of history. That current--the insights and forward movement provided by the TQH commentary which introduces each and every topic--will allow you to relax and enjoy the ride with your children. While the commentary is the key component, TQH also allows your children to experience the best in literature as they flesh out their learning. But our reading recommendations are truly flexible. No particular books are required; your family can enjoy whatever living books are accessible. How? Because the spiritual depth of the TQH commentary allows your children to probe for the important lessons in whatever they are reading. Happily, your children can learn and discuss the TQH ideas together (along with parents, ideally!) since God meant His truth to be sought by all, and they can then do their supplemental reading at their own level. This means that your children can have rich relationship throughout their learning together, which often gives impulse to creative, historical projects and play! So enjoy the flow, depth, breadth, meaningfulness, and flexibility of TruthQuest History! We welcome you to our website where you can read what others have said and see real samples. 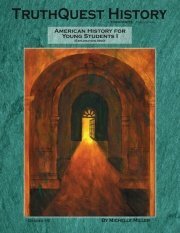 The American History for Young Students guides (three volumes which together cover the scope of American history) were written with elementary students (Grades 1-5) in mind. The main TruthQuest History series (seven guides which begin with ancient history and fully cover European and American history to just after the year 2000) are designed for Grades 5-12. This thorough compendium of living books and picture books is arranged by subject and date, with grade levels clearly notated. Commentaries summarize and tie topics together as you go from book list to book list, analyzing what is called "life's two most critical questions: Who is God? And who then, is mankind?" Written directly to students in a very informal tone, they'll move through ancient Rome in chronological order; you have all the freedom in the world to pick and choose what books to use and how to integrate activities (reports, newspapers, building demonstrations...). It follows key Charlotte Mason and Classical resources, and assists unit-study and unschooling families exploring an era. May be adapted for all ages. 80 pages, softcover, spiral-bound with short writing activities and answers plus resource list.